The UK has been warned to watch out for measles symptoms, after some European countries are in the midst of a large outbreak. There have been 440 confirmed cases of measles in England between January 1 and May 9, Public Health England (PHE) warned. More than 1,000 measles cases have been investigated across Britain since the beginning of the year. Most of the cases are caused by people travelling to and from continental Europe, it said. People most at risk are those that haven’t had both Measles, Mumps and Rubella (MMR) boost vaccinations. 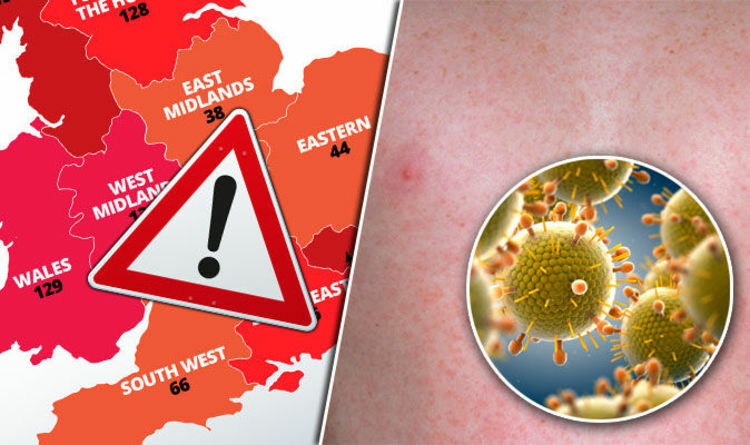 “The measles outbreaks we are currently seeing in England are linked to ongoing large outbreaks in Europe,” said PHE’s Head of Immunisation, Dr Mary Ramsay. “This serves as an important reminder for parents to take up the offer of MMR vaccination for their children at one year of age, and as a pre-school booster at three years and four months of age. Romania and Italy are the most affected European countries, PHE added. Last year, both countries reported more than 5,000 cases of the virus. Greece and Germany reported 967 and 929 measles cases, respectively. Measles is a highly infectious viral infection that can cause life-threatening complications, according to the NHS. Symptoms usually begin 10 days after infection, and include cold-like signs of a blocked nose, sneezing, a cough, and a fever. After a few days, patients develop a characteristic measles rash. The rash is made up of small red-brown spots, that can join up to make larger blotchy patches. It will usually appear about three days after the cold-like symptoms first appear. A few days later, patients could develop small greyish-white spots in their mouth. Most people recover from the virus within 10 days, but sometimes it can lead to life-threatening complications. Hepatitis, meningitis, and pneumonia could all develop after measles infection. About one in every 5,000 people die from the measles virus. You should speak to a GP as soon as you suspect you, or your child, have a measles infection. It’s a good idea to phone ahead to your doctor, as you could spread the infection further by visiting your GP.